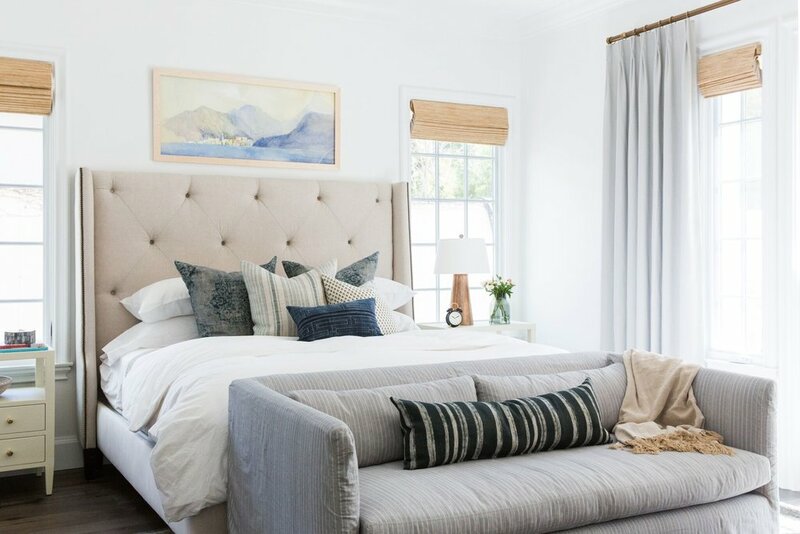 Yesterday we showed you the webisode for our Calabasas Remodel Master Suite, so today we're showing you the full transformation!! 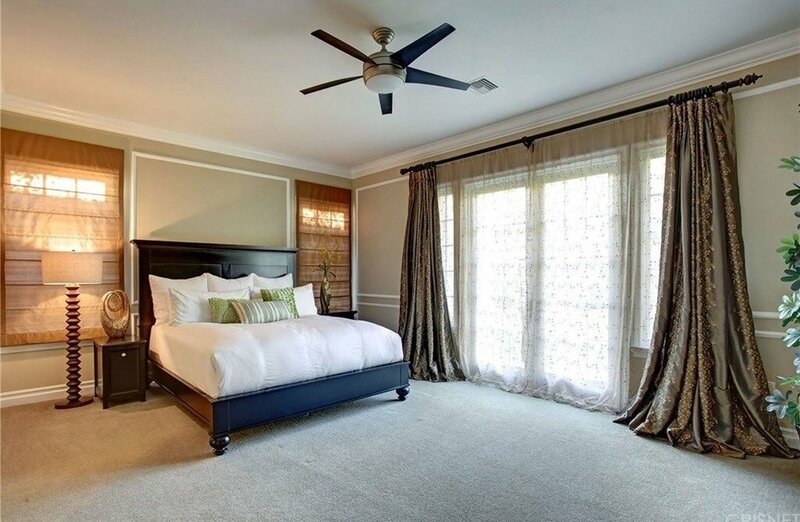 Our clients wanted a laid-back California style for their space that was elevated enough to feel like a Master Suite. Catch up with the rest of the Calabasas Remodel by checking out the Great Room, Kids' Rooms, Family Room, and Kitchen + Laundry Room! The space was really long, so were able to put an entire settee at the end of the bed. To ground it all, we used this rug in an 8 x 10 size. The laid-back California style is all about mixed textiles, natural textures, and a cool color palette. To keep things feeling fresh we try to choose patterns that work together, but don’t look the same. All of the custom pillows on the bed are different patterns but they still go together. The custom bed has tufting that makes it feel a little glam, which pairs beautifully with the lacquered nightstand with gold knobs. On top we contrasted the glam with a rustic, masculine wooden lamp. We fell in love with the color palette of this artwork. We specifically hung it level with the windows so the space doesn’t feel blown out. An area for relaxing is essential in a laid-back space. This custom chair is soft and natural, and we styled in touches of blue with the pillow, our Newport basket, and blue jars. We added a floor lamp with a bright white shade for when you need light. 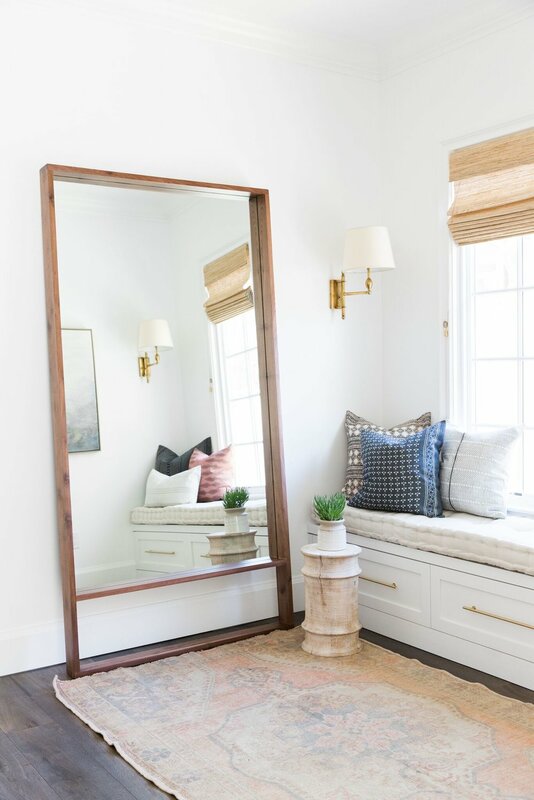 To utilize the space completely, we created a seated area with a standing mirror (check your outfit!). A statement sconce really stands out with the muted tones in the vintage rug and natural wood stool. Another statement in this space is the moody artwork. We love how it brings a touch of drama into the space. Across the way is a workspace that incorporates some amazing pieces. The woven chair has a cool stripe, and we love the substantial scale of the large lamp. The Celestial Map appears to be weathered and aged that pairs so beautifully with the antique charm in the chinoiserie planter. The bathroom was generic. The layout was great, so we didn’t move anything around, we just updated it. Our client's two wishes were the color blue and patterned tile, so we picked a blue patterned tile that would work as a jumping off point. We toned down the bold pattern with wood elements and white tile. The tub is a beautiful freestanding tub that is so pretty, and really makes the space feel luxurious. 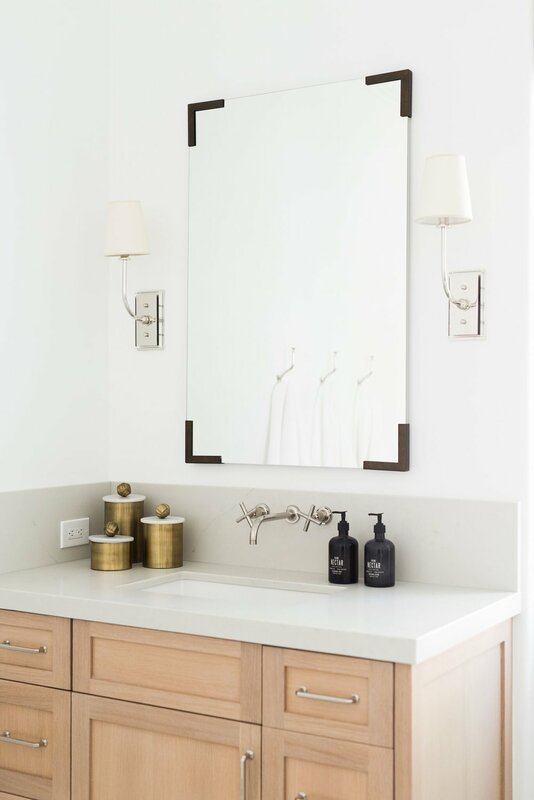 The sconces are polished nickel, and the pendant is silver, but we had to sneak in some brass! We did that with the corners of the mirrors and various accessories. We used a campaign desk that has the brass, lacquered details to keep with the glam vibe in the furniture. The chair is versatile and timeless, while the soothing artwork is perfect on a bold wall. At first glance, the built-in looks just like a plain white built-in. But if you look closer you’ll see the grasscloth texture and interesting hardware. We carried the polished nickel from the bathroom here by using a library light in the same finish. 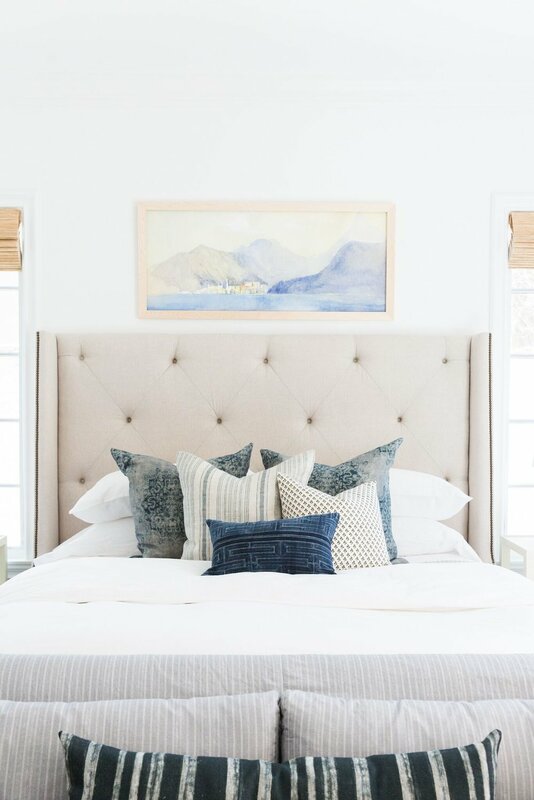 In this corner we juxtaposed the glam with a textured, coastal feel. The chair was also used at the head of the dining room and this photograph was made for a California home. The side table has contrasting texture and brings a bit of edge to the corner. Moments like this that are thought out, really bring out character in the home.